Bundi is a town spectacularly built 30 km from Kota. Bundi is famous for Tatrgarh fort which offers a splendid view of the city from the top. Tatrgarh fort has a beautifully crafted reservoir and the Bhim Burj which showcases a canon displayed in the battle field. Do visit the Badal Mahal inside the fort that displays paintings of medieval times. 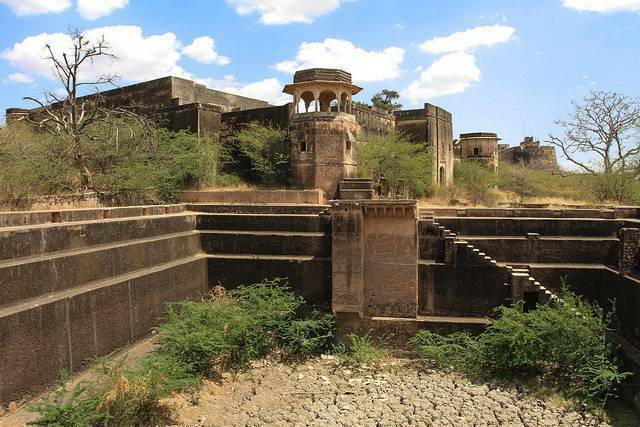 Bundi is famous for its step wells like Nagar Sagar, Ranji Ki baori and Nawal sagar kund. Do visit the Dhooleshwar Shiva temple located at the Talwas fort and Garh fort chitrashala. And visit to Bundi is not complete without visiting the Moti mahal which is a royal apartment decorated with mirror work, stones and 80 pound of gold. Did you know that the famous author and poet Rudyard Kipling resided in Bundi? Hashish is widely available and legally for sale in this area. The community is very friendly. It is said that if visitor stays for a week, he/she will experience not less than 10 counts of tea drinking invitations. By the end of the week, he/she is bound to know everyone within a 3 block distance. That’s what attracts people to Bundi, as well as its Rajput architecture. Less influenced by the national style in India during the Mughal period, it’s a breath of architectural fresh air to walk around the site. And in visiting some of the many attractions scattered around the city and nearby villages, you will learn how different life must have been here. Perhaps one of the most notable attractions in Bundi is the famous Baoris, or the step-wells. Previously rich and famous patrons had installed these devices. In times of drought, they provided invaluable sources of water to augment for its scarcity. The deepest of these runs to 46m deep. There are many things worth wandering around the city. It can be reached by travelling by bus or train. Spend time with Bundi and you will surely find an awesome experience.